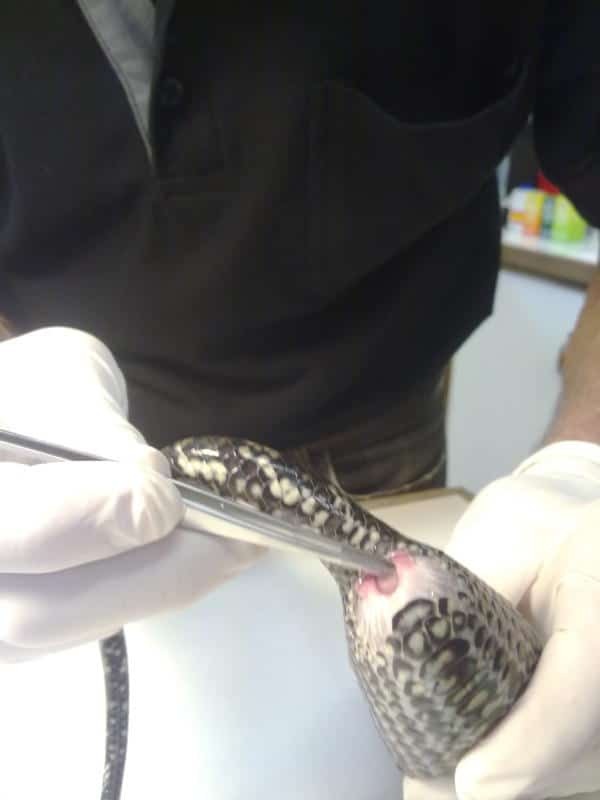 “Lips”, the Coastal Carpet Python had difficulty laying her eggs. She was presented with a definite bulge near the cloaca. At least three eggs could be palpated (felt). As the first egg was close to the cloaca, Peter, the vet, was able to avoid extensive surgery to remove the eggs. He was able to collapse and aspirate the contents of the first egg and then remove it from the uterus. After the collapse and removal of the first egg, three other eggs and three “slugs” (compressed, non-viable eggs) were able to be manipulated from the cloaca. “Lips” was feeling much more comfortable after the removal of the eggs.